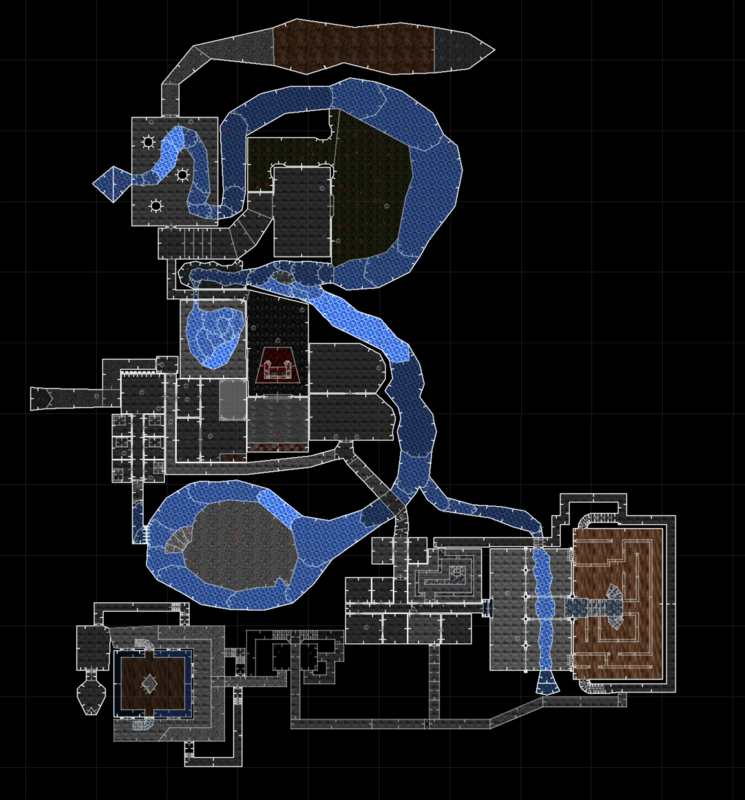 Elmore's Retreat is quest number 3 and consists of 6 maps. The quest is given to you by Captain Argus, and its ultimate goal is to find the Orb of Defense, a relic that was lost en route to Prince Elmore, who was fighting the Alaric and Gaiseric barbarian invasion. The reward offered is 150000 experience. A knock at your door in the inn wakes you. Who would be bothering you at this time? You shuffle out of bed and open the door. An Honor Soldier stands before you. Oh oh, what did I do, you think to yourself. "I have a message for you. Captain Argus has ordered me to bring you to his office at oh six-hundred hours. You will accompany me, please." The statement was obviously not a question. Feeling the urgency of the situation, you collect your stuff and follow the guard. The "office" as the guard put it is nothing more than another room in the main castle. There is a desk in the middle of the room, two chairs, and plenty of maps covering the walls and table. A stout man of about five feet paces the room practicing with his sword at an imaginary opponent. "Yes, please sit down," he says as you enter the room. Noticing the experienced sword play, you sit down. Finally the captain continues, "Please excuse me, I like to do my morning exercises at this particular time and I can't afford to let my skills go to waste." He parries the imaginary opponent. "I have heard that you are an experienced adventurer," slice chop jab. "Uh ... yes, that would be correct," you say, "sir." "You are certainly getting an ... interesting ... reputation. Perhaps you will consider doing a job for me," parry spin parry. Carefully getting to the point, you ask, "What job would that be?" "I need an item found of utmost importance. It is a matter of life and death to the King." Captain Argus continues his fight. You feel nervous as the ghost offender takes a stance near where you are sitting. The Honor Guard who escorted you stands by the door dully staring into space. "Before I begin, let me give you a little history. Prince Elmore was a strong lad. I taught him everything I knew in the military sciences and the way of weapons. He was like the mythical Mimic that learns everything you do exactly. By the age of sixteen, he was a killing monster that could even out sword myself and the best of the Honor Guard." Slice jab jab. "In that same summer, he vowed to kill the Great Dragon that was terrorizing the nearby region. No one had ever been able to kill a dragon so he was naturally ridiculed." Chop poke slice parry hold. "But to the surprise of the whole kingdom, he did it and brought back proof. He was titled Prince Elmore the Swift and Deadly Sword. King Gregor naturally decided that it was time for his son to have his own brigade." Argus stops to drink some water. He offers you some, but you decline and wait for the captain to continue. "Many years ago, the prince was sent to fight against the last barbarian invasion. We under estimated the size of the invasion and Elmore's brigade soon needed reinforcements and supplies. A large amount of currency was appropriated from the treasury and dispatched. The funds were intended to help him restock his supplies from the nearby towns. However, before the reinforcements could arrive, Elmore was forced to retreat. The treasure and its guard was intercepted by the barbarians. Without the supplies, Elmore's troops died. I hear that they held out for a long time, but not long enough for a second chance. I don't believe Elmore himself survived, but there have been reports that he roams the barbarian regions. Some say it is a ghost of his lost soul. "The two barbarian clans of Alaric and Gaiseric had allied to fight and were the reason for our mistake. Alaric, a warlock of immense power and evil, had discovered the capability to teleport large numbers of troops into Elmore's defenses. To counteract Alaric's spell, all of King Gregor's priests fasted and prayed. A magic orb was revealed to them now known as the Orb of Defense. Its purpose was just that, stop teleporting enemies. However, use of the orb is less than easy. The orb emits a tremendous electrical charge that will surely destroy any unrighteous mortal holding it. Only the pure of heart can safely use it." Finally the captains sits at the table, but keeps his sword in front of him. "The powerful device was lost with the treasure before reaching Elmore's hands. When reinforcements did arrive, they found the barbarians were truly weakened. Elmore had lost but fought a noble battle. Both Alaric and Gaiseric were defeated and the remaining barbarians scattered back into the country side." Captain Argus pauses. "What I'm about to say is of utmost secrecy. Tell no one. Can you do that?" he asks. He pauses for a moment, perhaps to interpret your response. Finally, he makes up his mind and continues, "I need that orb again. There lives one in the City of the Tower who is from ancient days, a master of deception and a master of natural elements. This kingdom has never known a greater enemy. I need this orb to stop the destruction foretold by his prophets. Evil is truly at the very gates. "Do you think you can get the orb back?" "I'm not sure," you say, "what do I have to do?" "Truth is, I don't have a clue where it might be. You should check out Alaric's and Gaiseric's original home bases. They are two structures that are here ... and here ..." he stands to point them out on a map. "There is also a light house near the shore line ... here ... where you might find more evidence. Be warned that the light house is haunted with the souls of many soldiers. If you still cannot find it, I suggest you trace Elmore's retreat. To help the reinforcements follow his retreat, he left magical marks of his royal symbol. These marks still exist today and can be seen even at night. The path as I understand it starts ... here. "If you find the lost treasure, it's yours. I want that orb," he declares putting his hands on his hips. He stops to look at you through narrow eyelids, "And if you are considering other markets for the orb, I don't recommend it." He leans over to meet your eyes, "Although I can't offer much else, I will provide you with personal training here at the castle as a reward for the deed." You notice that the captain has gotten quite serious and holds his hand over the hilt of the sword, "Can you do this task for your King?" Click below to show a summary of each mission including notable features, enemies and items. This mission takes you through Gaiseric's base (as described by the Map 1 notes, though it is inhabited by Alaric barbarians.) Notable features include a large throne surrounded by lava, a locked treasure room with little treasure, a mammoth sized bed, a couple of mazes (one of which pops up), and a number of rivers. It takes place mostly indoors/underground, with a couple areas outside. The enemies are Alaric Warriors, and Alaric Chieftains. This mission takes you through Alaric's base (as described by the Map 1 notes, though it is inhabited by Gaiseric barbarians.) Notable features include the deepest water in the game, a large number of secret passages, a spike ceiling trap, and a tall, hollow pillar I've never gotten into. The enemies are Gaiseric Guards and Gaiseric Magicians. Notable items include a ring of water walking. This mission takes you through a haunted lighthouse. The enemies are skeletons, Astarte's Death, and a Death Priest. This mission takes you through an open outside area with a river running through it. Notable features include a water geyser. The enemies are Gaiseric Guards, and Gaiseric Magicians. Notable Items include a Ring of Keys (required to complete Q3M6). This mission takes you through another open outside area with a long river running through it. Notable features include a hidden treasure room, revealed by a vine covered switch. The enemies are Gaiseric Guards, Gaiseric Magicians, and Elmore. Notable items include a Brass Key (required to complete Q3M6). This mission takes you through an open outside reservoir, underground caves and mazes. Notable features include a cave of lava, a lighting trap, a treasure room. The enemies are Alaric Warriors, Alaric Chieftains, Fire Serpents, and Gargoyles. Notable items include a Pentagram Key, Blue Key, the Orb of Defense, Mithril Studded Leather Armor, BloodRot (poison dagger), an Amethyst, Thieving Tools. This page was last modified on 28 December 2013, at 18:49.